Therefore, the importance of this topic shall be discussed for the hospitality industry. The overall purpose of this work shall be the finding of suitable opportunities and instruments for the implementation of Work-Life Balance methods for the hospitality industry. The report will be based firstly on a short illustration of the current situation of the working conditions in the field of hospitality, to have a good starting base for the later discussion, analysis and the solution finding. 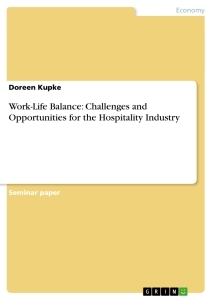 Secondly, the theory of Work-Life Balance will be described and different instruments will be pointed out and analyzed for their usability in the hospitality industry. The three different instruments of the flextime work arrangements, family services and the feedback shall be used as a base for this analyze. Thirdly, the evaluated outcomes will be connected with a best practice example of the Delta Hotels chain, which has successfully implemented the WLB theory into their daily working operations. A literature conducted analyze is used to gain the theoretical knowledge. The usage of different studies, professional articles and best practice examples, shall help to achieve a direct connection between theory and practice. Whereas chapter 2.1 pointed out general economical changes and new circumstances for the employee and employer, chapter 2.2 focused on special current working conditions within the hospitality industry. Combined, the given information alludes to increasing challenges in terms of employee satisfaction, motivation and the creation of a healthy working environment. Figure 1 is illustrating the main working challenges within the tourism industry. Those are current challenges; a hospitality industry has to overcome to run a successful business, with satisfied employees and customers. Therefore, the author was trying to find suitable opportunities to solve those problems inside the hospitality industry. The question mark in the illustration, figure 1, stands for the unanswered question, if a lived Work-Life Balance can be the solution to overcome the challenges within the hospitality industry and find opportunities to create a better working environment. An evaluation of Work-Life Balance methods and strategies shall help to find an answer. The next chapter will present the mode of action of WLB and the importance for the hospitality industry. WLB methods and instruments will be introduced and validated regarding their suitability for the hospitality industry. Those will be described in the following more in detail. The normative level is expressing the overall balance between the different life areas; a wholly successful life shall be reached.